Korean-Indonesian palm oil and pulp and paper conglomerate Korindo has already destroyed 50,000 hectares of precious rainforest in the Indonesian provinces of Papua and North Maluku, with few plans to stop. Should their outdated “bulldoze and burn” techniques continue, indigenous communities and endangered animals like tree kangaroos could lose their homes forever. Last year, Korindo’s forest-clearing techniques made it one of the largest contributors to the deadly haze that plagued Southeast Asia. A new report released by Mighty details the company’s abuses so far, as a stark sign of things to come for the rest of Korindo’s concession—a forest at least 7 times larger than Paris—if we don’t act now. We can’t do this without you. 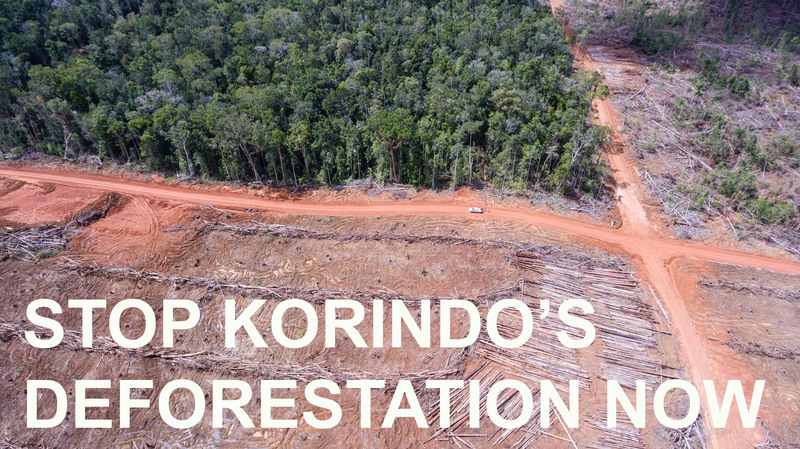 Sign on to demand Korindo stop bulldozing and burning the forest and return community lands immediately. Together, we can build massive public pressure too big to ignore. Let’s make sure Korindo’s time operating with impunity to destroy communities and habitats is over. It's well past time for you to clean up your act. Korindo needs to make no-deforestation policy, stop stealing community lands and restore the lands you've already destroyed.